Pipe connector couplings WA-GZ units connect pipes from 100 mm to 2400 mm outside diameter (4" - 96") OD pipes. 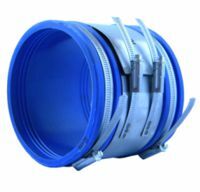 WA - GZ pipe couplings offer multi functional outer clamp bands and an inner clamp. The outer clamps insure tightness on the pipe. The inner clamp bands insures pipe alignment and prevents bending at the joint. Sealing elastomers are EPDM and NBR and Silicone with 304L stainless steel clamp bands. Pipe connectors are designed for connecting "Plain end pipes". 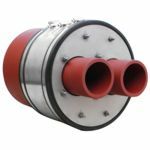 The flexible couplings consist of seal elastomer material and stainless steel clamping bands. HDPE, PVC, Steel, PE, Cast Iron and concrete pipes. 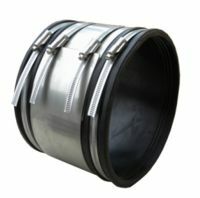 Special designed with outer bands for tightness inner bands allow axial movement. 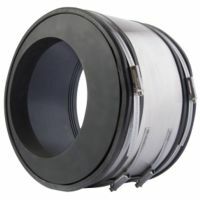 WA-GZ-DS pipe couplings seals, allow connections of different size pipe diameters. A WA-GZ-EX pipe coupling can accommodate pipe that are not centered or concentric joints. All pipe sizes may be accommodated. Multi pipe connectors for two or more smaller pipes connecting into an existing larger pipe. A WA-GP-MC units seal smaller diameter pipes connecting to a a larger collector pipe. 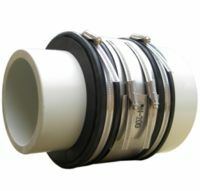 The smaller pipes fit through the end and are sealed using a WA-GP-W and WA-GZ-MC connector combination. 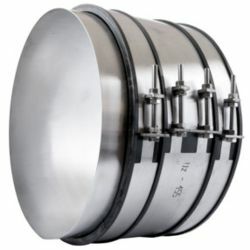 pipe coupling connectors, spigot connectors, plain end, sewer pipe connectors, low pressure pipe connectors, pipe connectors, 304L stainless clamps, USA and Canada . USA: Texas, TX, Houston, New York, NY, Illinois, IL, North Dakota, ND, Iowa, IA, Ohio, OH, Michigan, New York, NY, Kentucky, KC, California, CA, Colorado, Denver, Louisiana, LA, Florida, FL., Pennsylvania, PA. Wisconsin, WI. Canada, Ontario, Oakville, Toronto, London, Hamilton, Mississauga. Alberta, AB; Edmonton, Fort McMurray Calgary. British Colombia, BC; Kelowna, Vancouver, Prince Rupert, Kitimat. Saskatchewan, SK; Regina, Saskatoon, Prince Albert, Esrevan, Swift Current. Manitoba MB; Winnipeg, Thompson. Quebec, QC; Montreal, Quebec City, Trois-Rieviers, Chebougamau, Sherbrooke. QC, Alberta, Saskatchewan, Manitoba, Quebec, New Brunswick, NS, Newfoundland.